Well, now that I have some of my primary furniture items figured out, I can really start thinking about their placement. After measuring and doing a scale drawing of the room, I can start dragging my furniture around in the space–at least virtually. 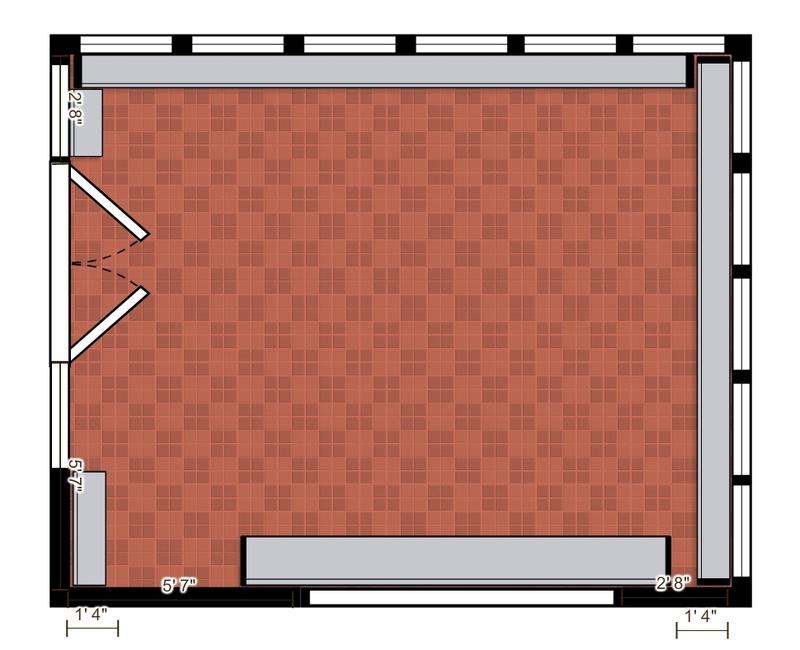 My scale rendering of the sunroom floor plan. Let the designing begin! So I started by thinking about where I should position my area rug. I decided I’d like to use an 8’x 10′ area rug–mostly because I don’t want to overwhelm the space and also because I’d like to have 2 separate areas, or zones, for furniture within the room. I find that area rugs are wonderful for containing a furniture grouping or seating area, and for directing traffic flow. If I place my area rug where the homeowners originally had their rug placed (which you can see by the residue of the rug-pad on the tiles), it will really affect where I place my furniture. I’d rather not have my rug positioned this way, because it means my furniture has to be centrally located. 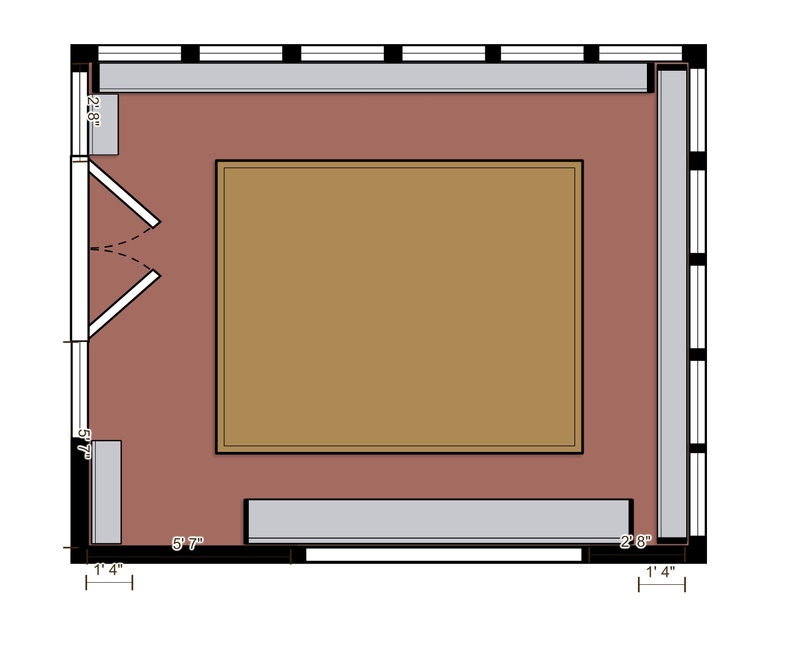 Placing the rug in the center of the room, requires the furniture to be floating in the middle of the room, dominating the space. Ideally, I think it would be best for the rug to visually lead you out into the seating area, which I envision on the right side of the room. 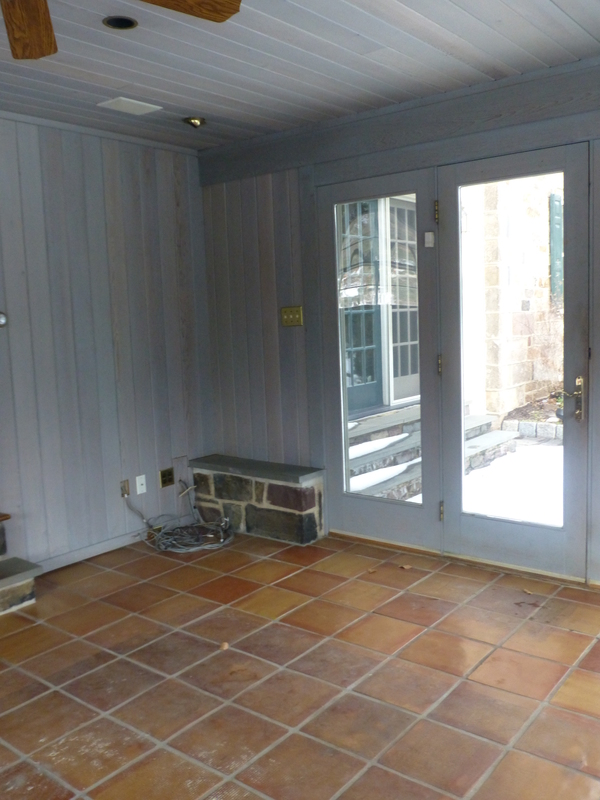 So I’d like to position the rug in this direction–straight out from the steps leading down into the sunroom. 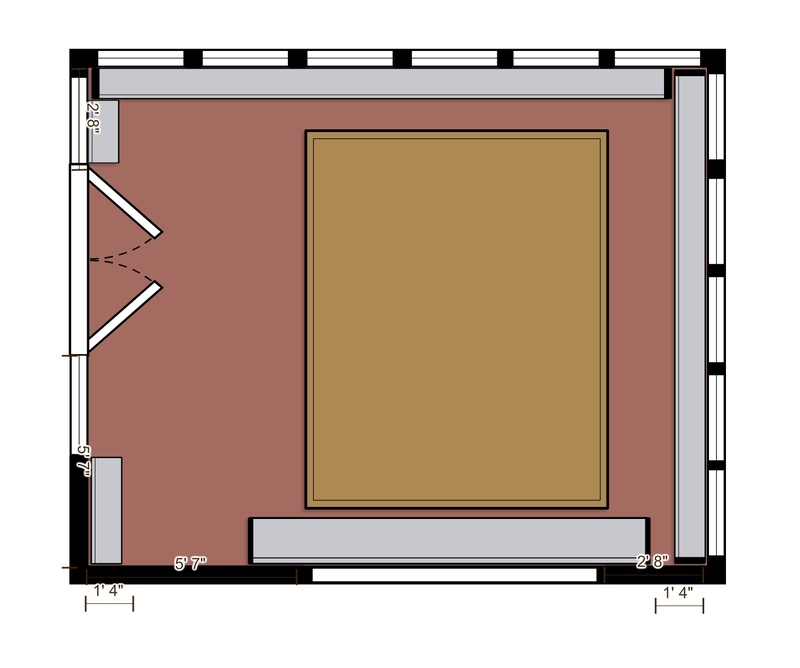 By rotating my rug to be in line with the steps leading down from the kitchen, I can draw visitors into my seating area positioned at the right side of the space. OK, so I bet you’re wondering: What kind of rug will she use? 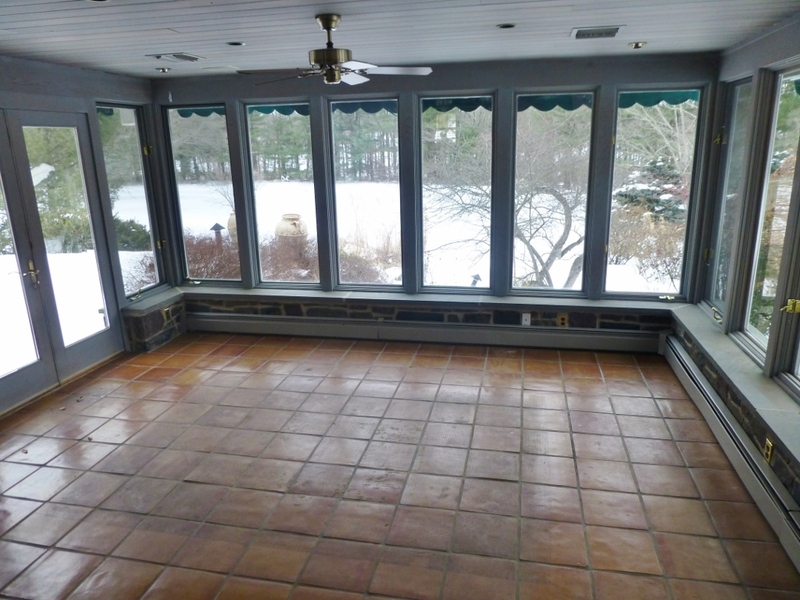 Well, I decided to really let the area rug set the tone for the sunroom and give it an updated contemporary feel. After all, it’s one of the most expensive elements in the room, and has a lot of impact on the space, since visitors will be looking down upon it when they first enter the room. Initially, I looked at many gray, traditional rugs. But the one I kept coming back to was this wonderful, funky, cowhide strip rug in a herringbone pattern. I love it! 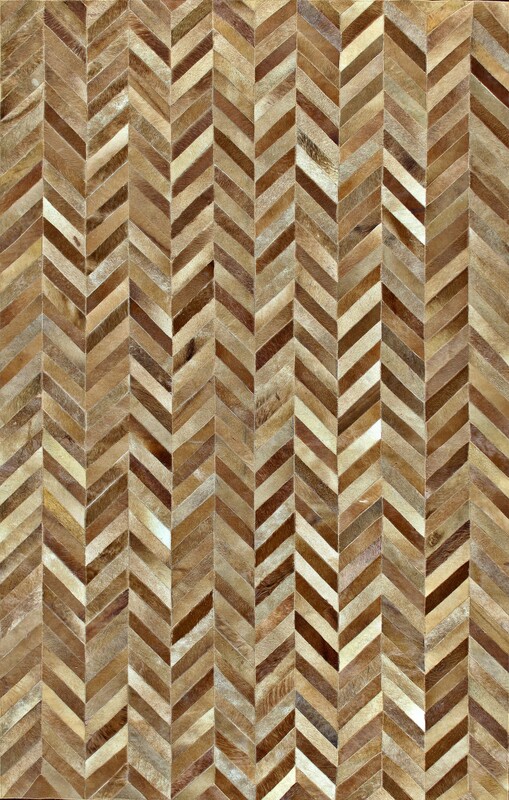 An amazing 8×10 area rug made from strips of cowhide, sewn together in a herringbone pattern. I think this rug is ideal for my sunroom. First, the leather/cowhide will be extremely durable (after all 8-10,000 people will be traipsing across it during the month of May). Second, I love the contemporary vibe the herringbone pattern creates. And thirdly I adore that natural warm color found in the cowhide, and how it will mesh with the golden rattan from the chairs and the warm tones in the terra-cotta floors. Hmmm…seems like my color scheme is really starting to materialize! I’ll let you know how it goes, since I’m finally allowed into the space this week (during March and April 2014) to begin my work. Next time, I’ll talk more about my decisions for the actual furniture placement. Make sure you take the time to post a comment and let me know what you think about my latest plans for this room and the rug placment. I LOVE to hear from you! This entry was posted in Designer House, Home Decor, Interior Design, Rug, Sunroom, Uncategorized and tagged Bucks County Designer House, Decor, Decorate, Decorating, Design, Finishes, Interior, Interior Decor, rugs. Bookmark the permalink. hope you can get the tile clean- maybe goo be gone? I’m going up there today to have a crack at it, Betsy. I have several solvents/cleaners to try. Truthfully, it’s only about 2 rows of tile that will show…so I’m hopeful I can make some improvement! Thanks for commenting and following along with my progress! Thanks so much!! I’m really excited about the updated vibe this rug represents. This room will definitely be a relaxed and fun mix of curated objects. Thanks again for following along with me!